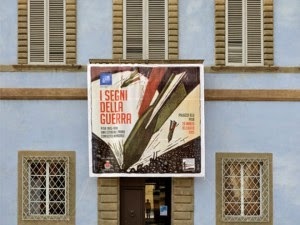 The Blue Palace Foundation in Pisa gives hospitality to an interesting photographic and documentary show in memory of the World War One. The exhibition has its focus on how inhabitants were influenced and conditioned by war atmosphere. From the “radiant days” to the military mobilization, besides the material and intellectual efforts of a territory, is here called to be represented the war years’ impact on population. Curator is Antonio Gibelli, professor of Contemporary History at University of Genoa, WW1 period expert, in collaboration with professor Carlo Stiaccini and doctor Gian Luca Fruci, who conducted archival searches. We can look at different shots of a tragedy, beginning from the call-up of fighters, passing by citizens’ different activities to solve war requests (female workers role, hospitals, airport and flight schools). A wide section is fit in memory and celebrations of the fallen. This frame shows the people letters and postcards written at the front by Pisan soldiers. Each of these documents is full of home sickness and talks about great expectations to the end of the conflict. A sort of inner world rises at our sight, depicting the eternal, never explained contradictions of fighting, this alienate junction of human and unhuman through the being comrades and soldiers.